Product #18454 | SKU CW-3 | 0.0 (no ratings yet) Thanks for your rating! 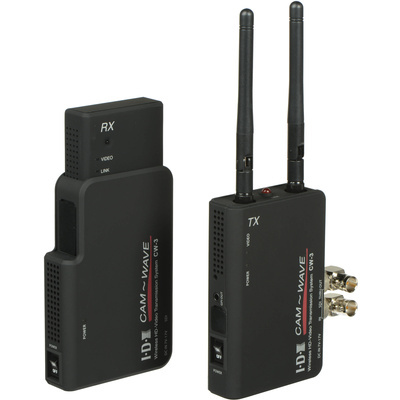 The CW-3 3G-SDI Wireless Video Transmission System from IDX is able to transmit Full HD 1080p video at up to 164' line-of-sight with no quality loss and less than 1 ms latency. It can transmit even further; up to 380' line-of-sight (depending on conditions), but at this extended range some loss in quality may be experienced. It supports 3G- and HD-SDI video signals at up to 1080p60 with 4:2:2, 10-bit color. AC adapters are induced for the transmitter (Tx) and receiver (Rx), or they can be powered from a 7 to 17VDC external source, such as a video battery system with PowerTap. A 1/4"-20 adapter is included for mounting the transmitter on a camera. Note: FCC compliant; other countries may require different frequencies.